When Franklin was a postmaster he had to organize routes for efficient mail delivery. He needed to know distances and traveling times, so he invented a gadget (odometer) that he attached to his carriage to measure mileage. Franklin was both near-sighted and far-sighted. This meant he used two pairs of eyeglasses - one pair to read and one pair for viewing at a distance. In 1784, he decided to combine the two pairs of eyeglasses into one pair. He split the lenses making the top half for viewing far away and the bottom half for reading. This invention was appropriately named "bifocals". Ben Franklin also invented a flexible urinary cathetar in December, 1752, to help his older brother who was suffering from kidney stones. Franklin wanted to protect structures from lightning. He conducted experiments which confirmed that lightning was electricity. The most famous of these experiments was when he flew a kite with metal wire and a key during a lightning storm. He conducted further experiments in his home by attaching an iron rod to his chimney. The rod was connected to a length of wire that ran down through his home along the staircase. The end of the wire was split in two and bells were attached to both ends. A brass ball was suspended between the bells by a silk thread. 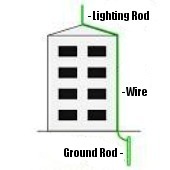 When lightning struck the chimney rod, electricity would flow through the wire and cause the bells to ring allowing Franklin to observe the movement of the brass ball. He concluded that electricity was fluid, that it circulated, that it "electricised" positively or negatively, and that it passed from one thing to another. In 1753, based upon his experiments, Franklin invented a lightning rod that directed electrical current into the ground thus saving structures from catching fire from lightning. He wrote a description of his lightning rod in an article entitled "How to Secure Houses, etc., from Lightning", which was published in the Poor Richard's Almanac. Franklin wanted to provide a better and safer method for heating homes. Most colonial homes had poor insulation and they were heated by wood burning fireplaces that were inefficient. Lots of wood was needed and most of the heat went up the chimney. Franklin invented a wood burning iron-furnace in 1742 known as the Pennsylvania Fireplace or Franklin Stove. It heated fresh air from an intake which vented warm air into a room. It used less wood and created more heat than a fireplace. Ben Franklin invented a glass armonica. It is a musical instrument based upon the sounds that are produced by rubbing the rims of glass bowls with your fingers. Franklin removed the stems from different sizes of wine glasses and mounted them on a spindle in order of increasing size. The spindle could be rotated at varying speeds using a foot pedal. A musician would touch the edges of the rotating glasses creating a melody of sounds. Later use of other types of glass improved the scale, pitch and tone of the music. Lesser known Franklin inventions were - a rocking chair with a fan (rocking caused the fan to turn on), a pole with a mechanical grip (used to reach high shelves to grab books), swimming fins and a ladder with a seat. None of Benjamin Franklin's inventions were patented. Before the United States Constitution was ratified in 1789, anyone seeking a patent needed to obtain one from each individual British Colony in the Union. After Confederation, patents were then issued by individual States until the first Patent Act was ratified in 1790. Inventors would have patents registered with a British Colony or a State or both. Patent law was understandably confusing and primitive during this period of American history. This often led to frivolous applications, infringement disputes and lengthy delays in registrations. One of the most important inventions during this time was the "Cotton Gin" invented by Eli Whitney. This device mechanically removed seeds from cotton and contributed to the economic development of the plantations in the Southern States. Whitney received a patent in 1794 but spent most of his time defending himself against lawsuits. He eventually went bankrupt from litigation. His patent was not validated until 1807. The founding fathers were well aware of the problems associated with patents. Roger Sherman served on the Committee of Five that drafted the Declaration of Independence. He was the only person to sign the Declaration of Independence, the Articles of Confederation, the United States Constitution and the Articles of Association. He was also Eli Whitney's cousin. Sherman was friends with Thomas Jefferson and Ben Franklin. Jefferson was also an inventor and, like Franklin, also decided against filing for patents on his inventions. Thomas Jefferson eventually headed a three-man committee in an attempt to improve the patent system. These improvements continue to this day. Scientists have discovered how to make smartphones transparent.